Rishat Dilmurat was born in Hoten (Uyghur Autonomous Region, China). He received a master degree in theoretical physics and application from Cergy-Pontoise University Paris in 2017. 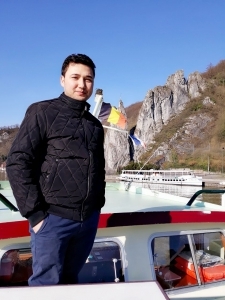 At the end of 2017, he joined the University of Mons and the Laboratory of Chemistry of Novel Materials as a PhD student in the group of Prof. Roberto Lazzaroni, under the supervision of Prof. David Beljonne. His research topic is: “Triplet migration and annihilation in organic conjugated materials”.